Summer is here and families all around will be hosting barbecues, picnics, and grilling for their guests. Most years, my extended family has a large gathering at the lake. Since they take care of all of the kosher meats for grilling, we often bring sweet treats to share. The best part of baking is that my kids can get involved and help. When we head to our local Price Chopper, I make sure to check the ads and coupons that they offer for additional savings. This time of year, Price Chopper is filled with the House of BBQ items. You can get recipe suggestions to help with your party planning. 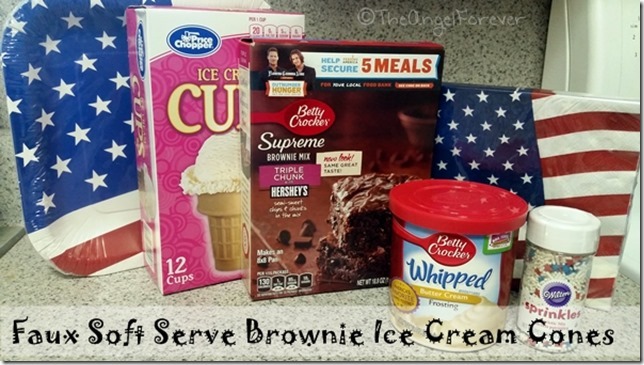 While walking around the seasonal section, produce, and dessert aisle with Betty Crocker Brownies, I came up with two fun ideas for parties at home or on the go. Nothing says summer fun like a soft serve ice cream cone. Of course, ice cream melts and is not always practical when at a celebration. We decided to try a new twist on an old favorite. Kids of all ages love cupcake cones. Rather than fill the cones with cake, my youngest begged to try the Betty Crocker Supreme Triple Chunk mix. We grabbed that and a few others items for our recipe. I followed the directions on the brownie mix which called for an egg, vegetable oil, and water that were not pictured. While my oven preheated to 350, I placed the 12 ice cream cones into a cupcake tray. Then, I filled each of the cones with approximately 2 tablespoons of batter. This fills the cones to the main line inside. These baked for 20-25 minutes until they were clean to a toothpick (if you use the triple chunk just remember there are lots of gooey chip spots). There will be extra brownie batter left. 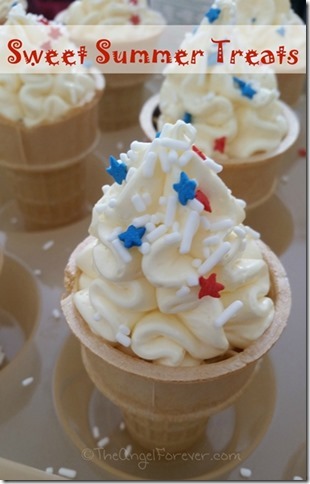 You can make additional cones or use it for the other dessert that I made below. 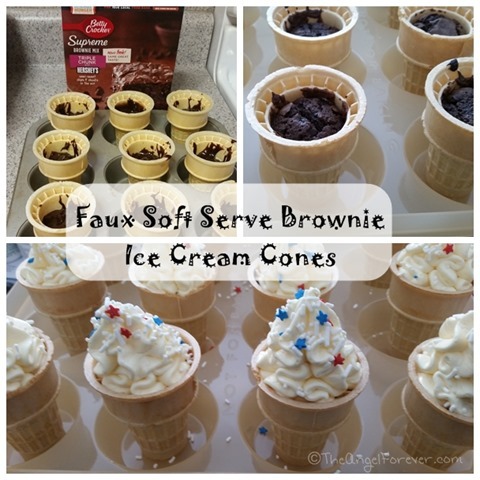 Once the cones were cooled, it was time to transform them into soft serve ice cream cones. The new Betty Crocker Whipped Butter Cream Frosting was an amazing shopping find. 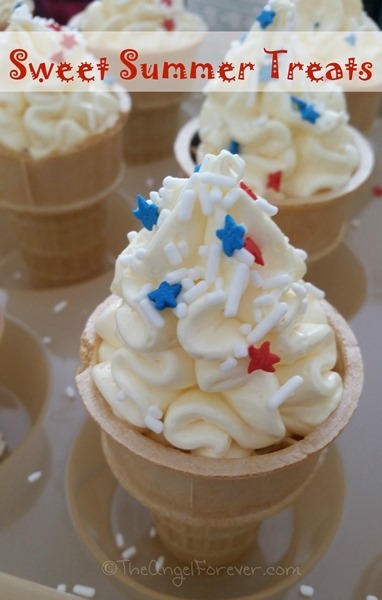 When this frosting is piped onto the top of the brownie cone, it looked just like soft serve vanilla ice cream. Top with sprinkles that match the occasion, and you are all set. Summer time means indulging in a bounty of fresh fruit produce. I still have memories of going to Price Chopper one summer and picking five pounds of cherries with my cousin who was in from California. We then sat outside devouring them while seeing how far we could spit the pits. These days, I still smile when picking up cherries, so I had to get them to garnish my summer plates. Fruit kabobs are a refreshing treat and kids just love anything on a stick. I grabbed strawberries and green grapes. I also bought some kosher marshmallows and Price Chopper lite whipped topping. With the remaining brownie batter from the Faux Soft Serve Brownie Ice Cream Cones, I made a dozen mini brownies. I spooned one tablespoon into each of the mini-muffin trays. These bakes for about 17 minutes at 350. 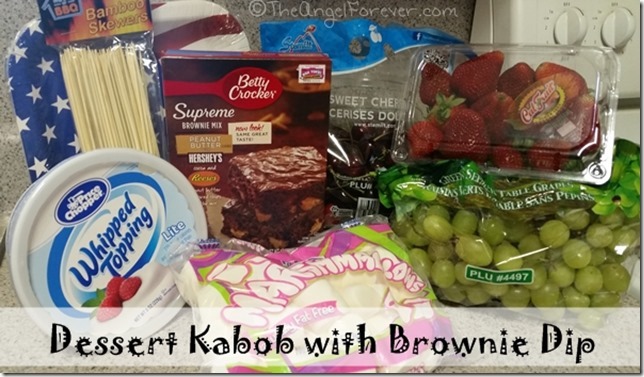 Once my whipped topping was thawed, it was time to make the Brownie Dip. The small container of Price Chopper whipped topping has about three cups in it. I then mixed in one cup of the Better Crocker Supreme Peanut Butter mix. The peanut butter chips add a fun surprise to the dip. You could also add in mini chocolate chips or sprinkles. Once this was ready, it was time to construct the Dessert Kabobs. I bought the smaller House of BBQ skewers. 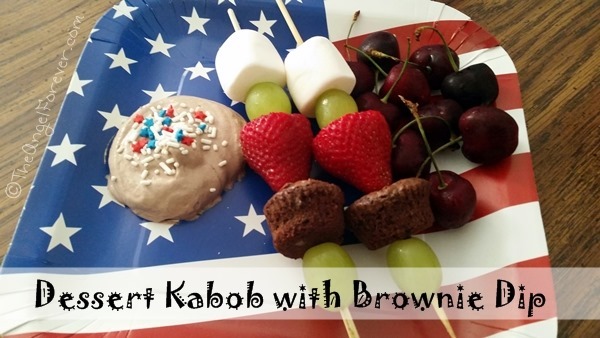 Each completed kabob had a marshmallow, two green grapes, a strawberry, and a mini brownie. When everything was ready, I plated them with some of the Brownie Dip and cherries. To make it a bit more festive, I put some sprinkles on top of the dip. The dip is really versatile and would be great with animal crackers or any other fruit that looks great when shopping. 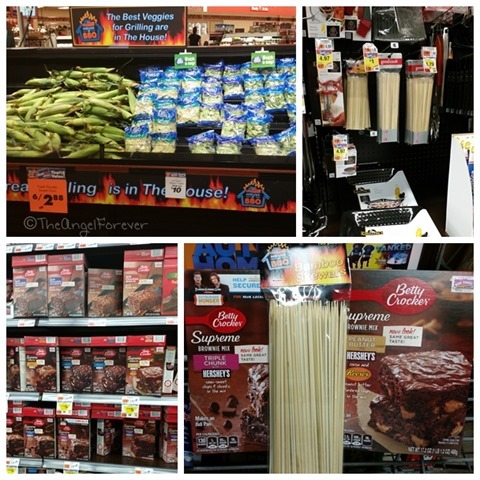 Be sure to check out recipes and ideas from the other bloggers participating in the #PriceChopperBBQ campaign. Lots of recipes for grilling and more for those getting ready for the 4th of July and beyond. You can also head over to the House of BBQ Pinterest Page and follow Price Chopper on Twitter where they share many additional items. 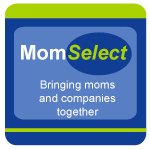 If you are on Facebook, be sure to look at their page where additional coupons and money saving offers are often posted. What is your favorite dessert to make during the summer? 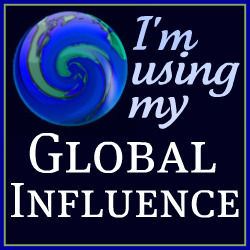 I would love to hear your ideas and whether or not you get the kids involved in the process.